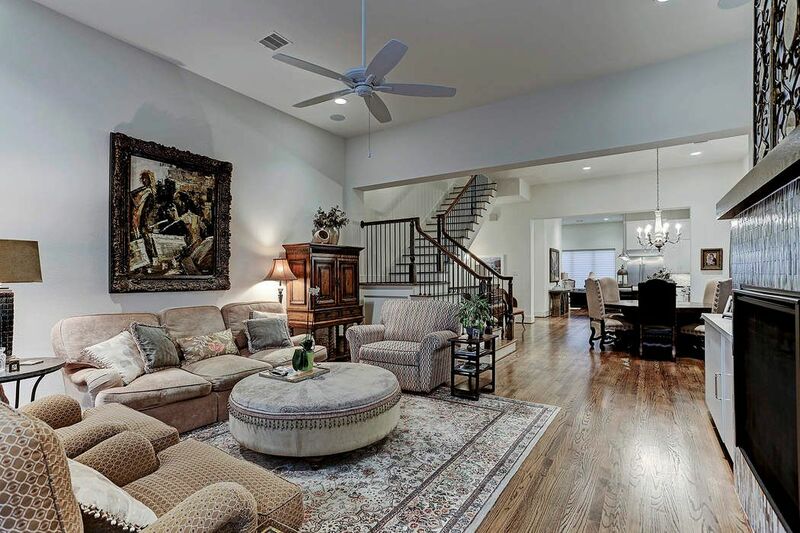 1526 Vermont Street, Houston, TX 77006 | Martha Turner Sotheby's International Realty, Inc. 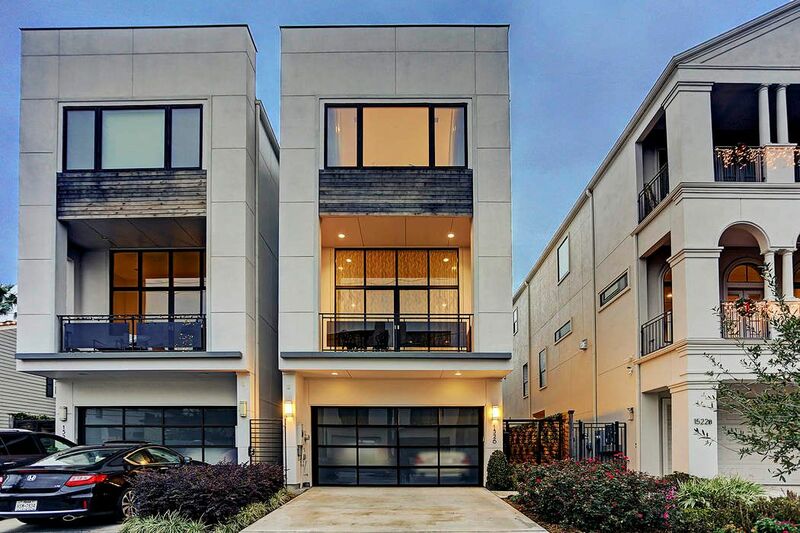 This stunning Montrose townhouse, built in 2015 by Charles Martin, is the epitome of sophisticated city living. 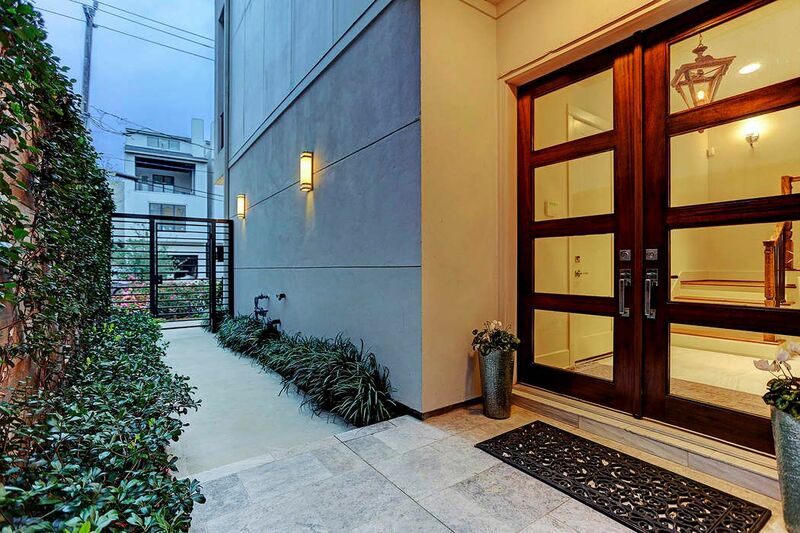 Entry to this gorgeous home is through the iron gate and a lovely garden leading to the foyer doors. 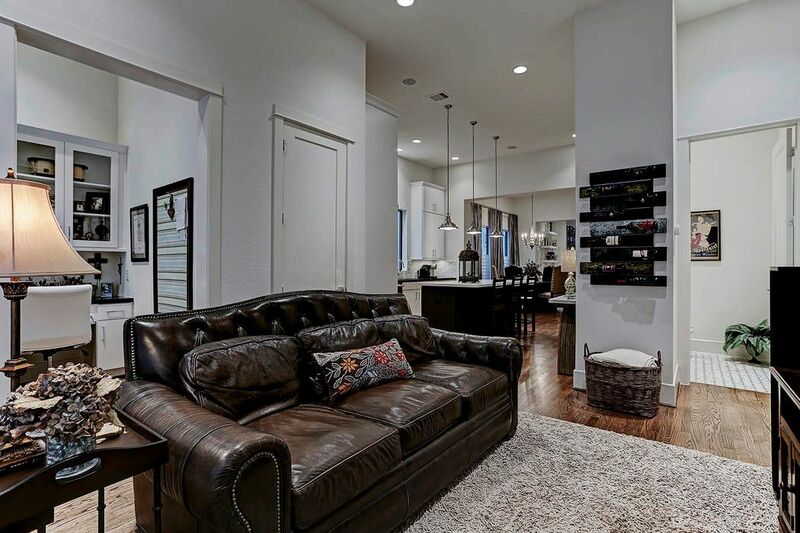 Outstanding features of this remarkable home include a backyard, roof top terrace complete with fireplace and city views, elevator capability, high end finishes and plenty more! This is a must-see. 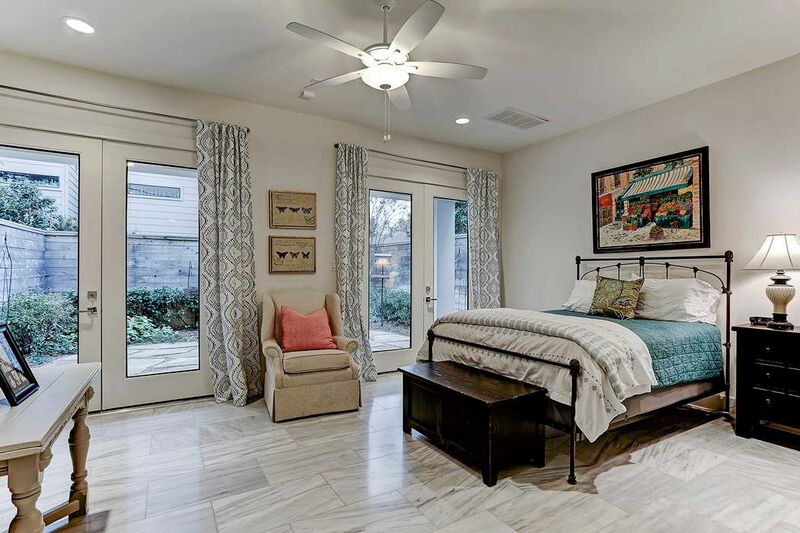 The outstanding location is close to world-class shopping, buzz-worthy restaurants and the award winning Buffalo Bayou Park. Easy access to the medical center and downtown are a plus. Note the unique Italian chandelier and beautiful stone floor. The closed doorway leads to the garage. 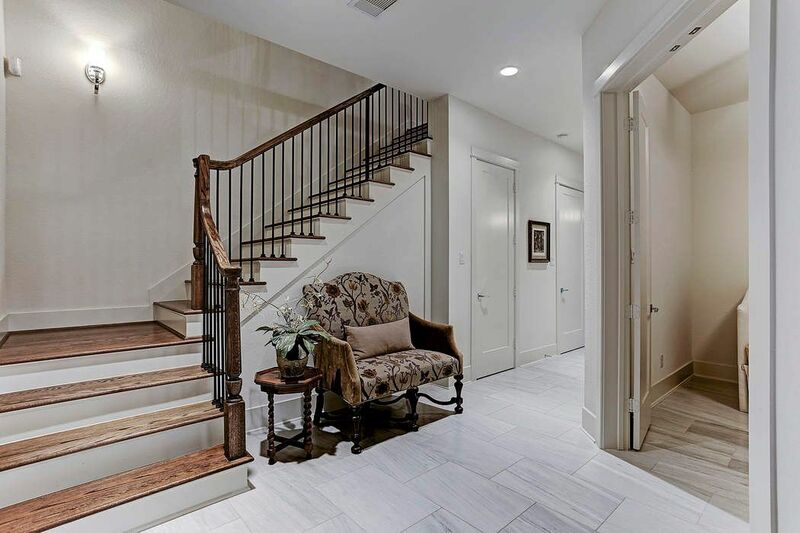 The home has elevator capability to all floors. The foyer is unusually large. The door immediately to the right leads to a small bonus room -- perfect as an office and for storage. The two closed doors lead to closets, one of which is elevator capable. 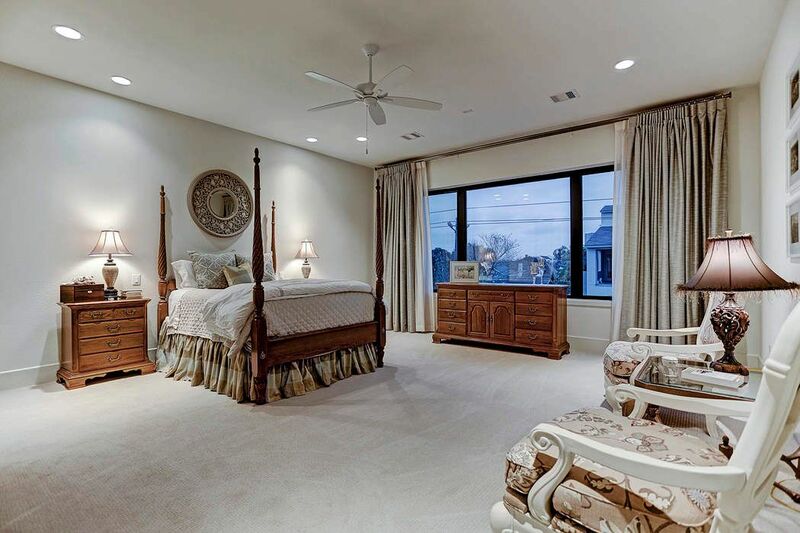 This airy first floor room is being used as a bedroom but could easily serve as a family room opening to the backyard. 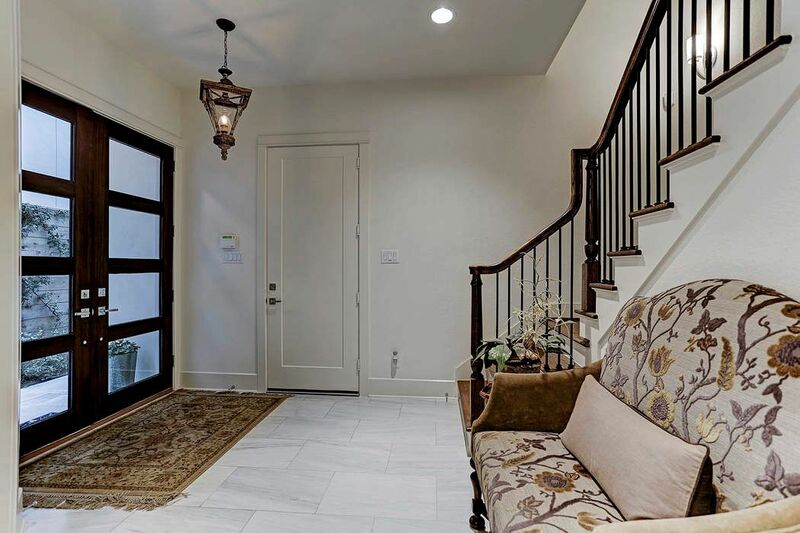 An upgrade from hardwood floors ensures the room can withstand lots of traffic through the doors leading out. This viewpoint gives you a good idea how large and flexible this room is. Situated off the entrance foyer, this flexible space can be used as an office, sleeping space for guests and storage. 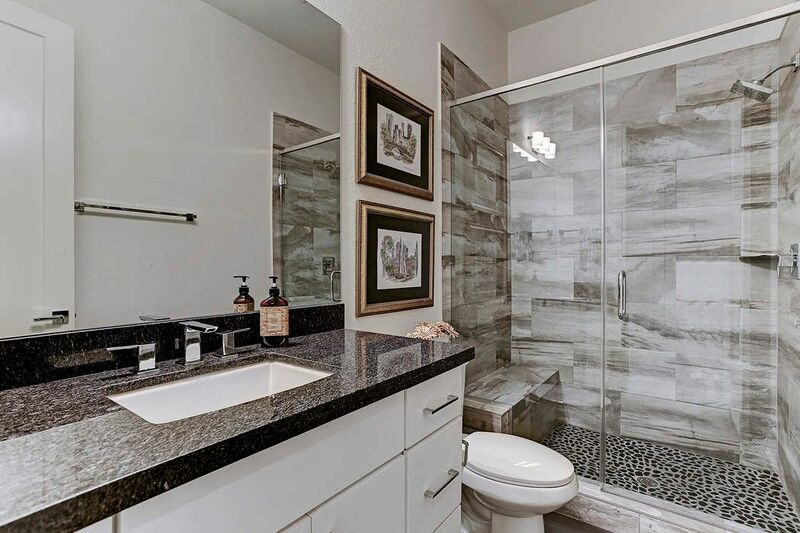 Beautifully appointed, this full bathroom is located on the first floor. 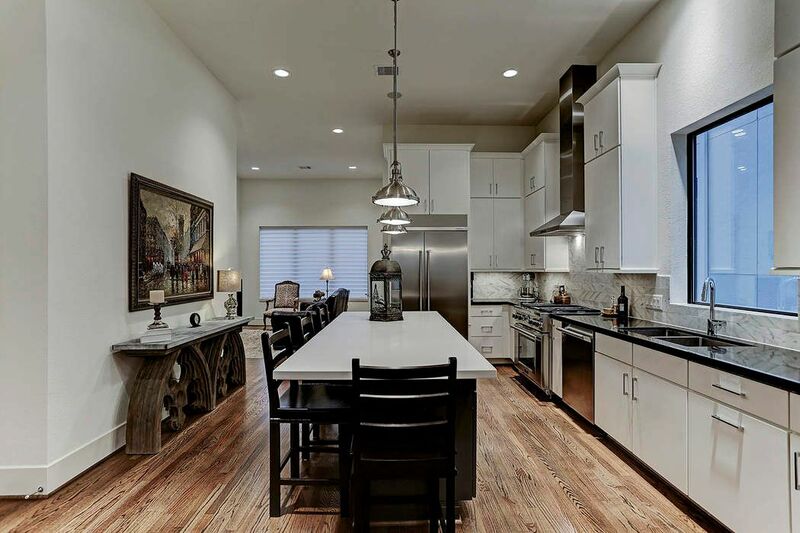 Perfect for the discerning chef, this kitchen has it all! Hard working appliances, tons of storage, excellent mood and task lighting and beautiful Silestone and granite countertops and backsplash. The over-sized window lets in plenty of light. Great view of the kitchen and family room in the background. Notice all the space! Oversized island provides for in-kitchen dining. This view of the family room shows the proximity to the kitchen. The closed door in the back leads to an oversized walk-in pantry. The open door to the right leads to the powder room, discreetly tucked away. 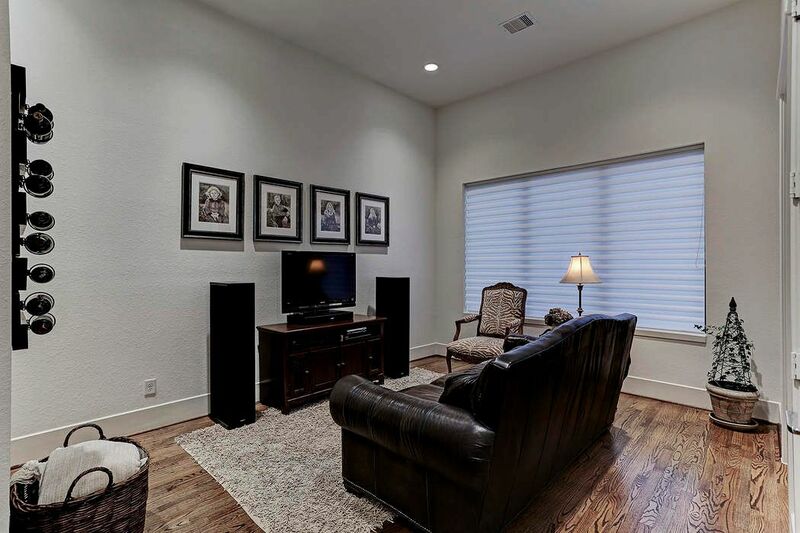 Immediately adjacent to the kitchen is the comfortable family room. Note the hardwood floors, which run throughout the second floor and the large window overlooking the back yard. 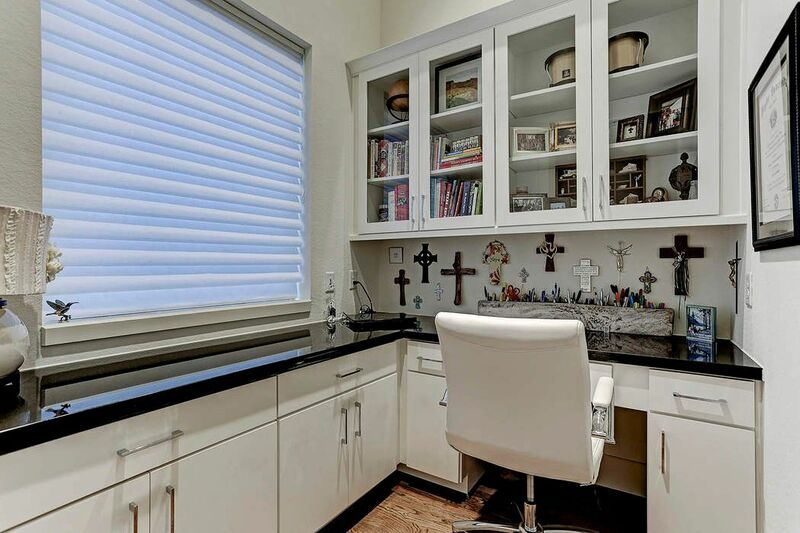 Conveniently tucked behind the kitchen, this study has great storage and pretty glass front shelves to display treasured objects! Dramatically located at the top of the stairs (you can see them reflected in the windows! 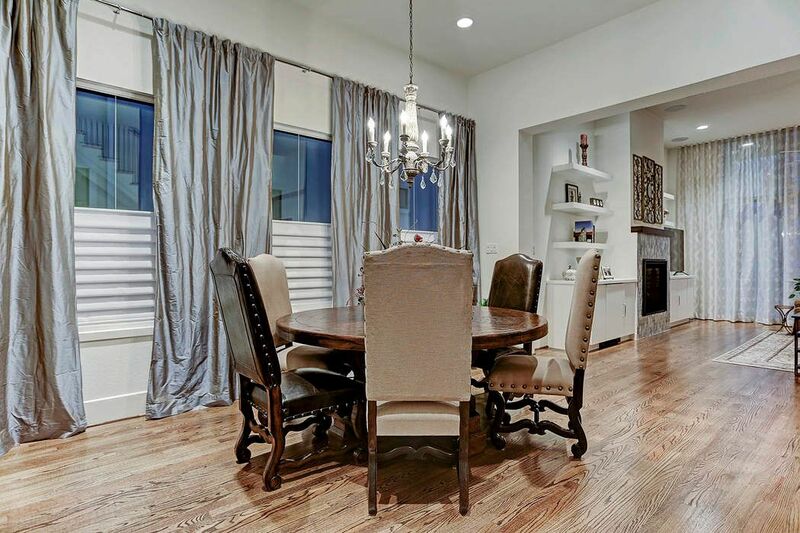 ), this beautiful dining room features a custom chandelier and sophisticated window treatments that provide privacy as well as elegance. The dining room has plenty of space, even accommodating this huge round table with room to spare. 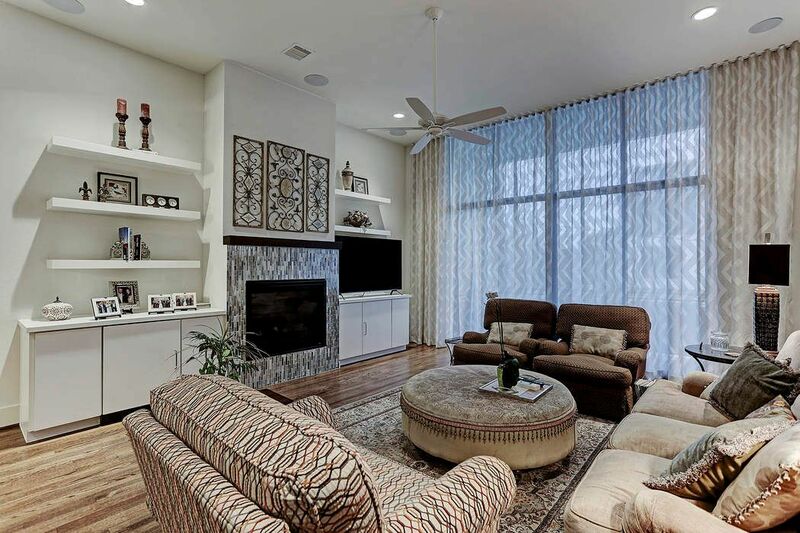 The custom window treatments and chandelier stay with the home. 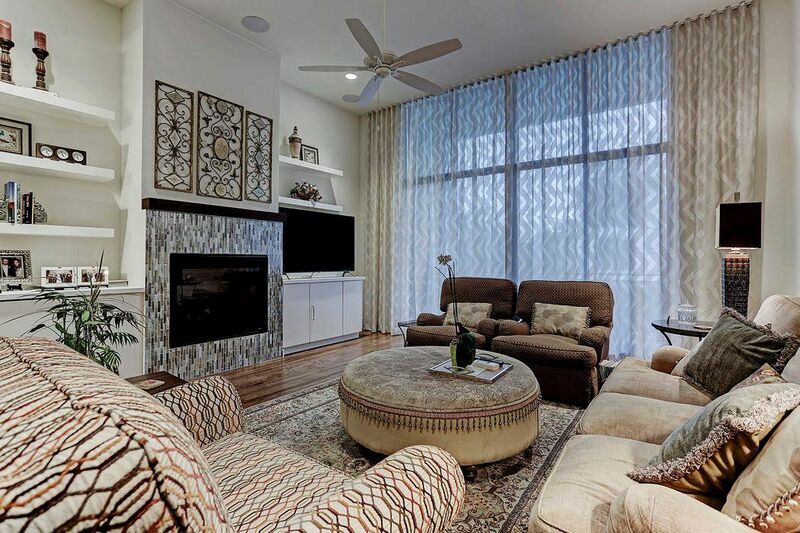 The large living room is perfect for entertaining a large group and cozy enough for intimate gatherings. 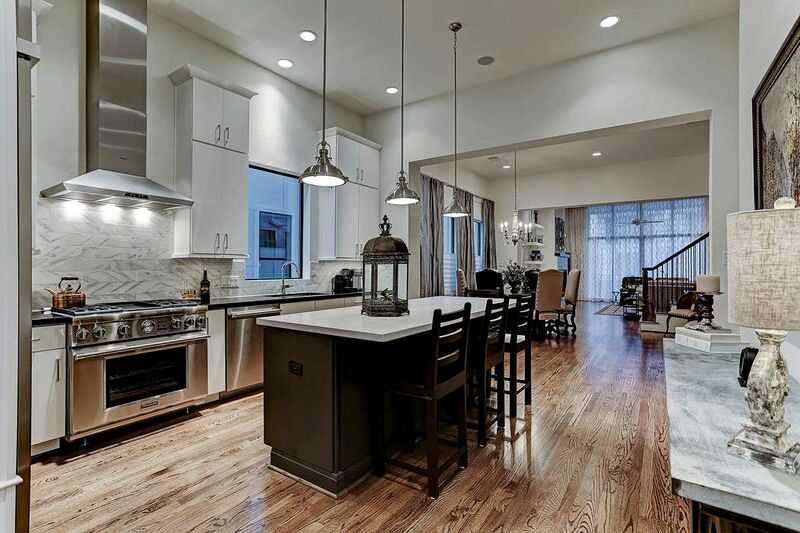 These open spaces flow beautifully and are great for entertaining regardless of the size of the group. A wall of glass leads to the balcony. The sophisticated window coverings can be retracted to allow easy access outside. 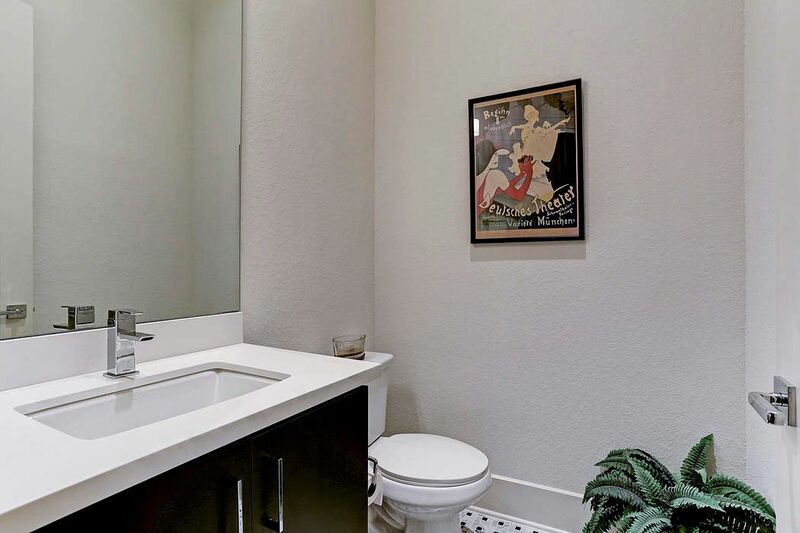 Sleek and contemporary, this powder room is off the beaten track, tucked in behind the family room. 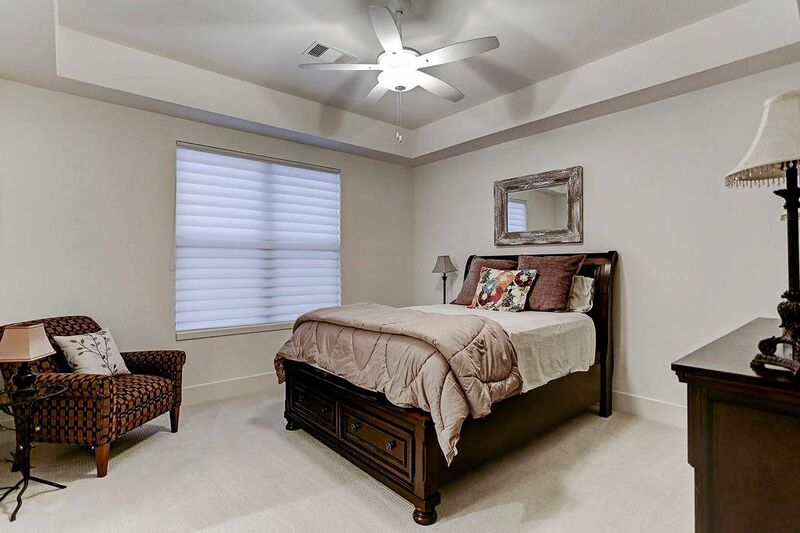 Oversized windows with beautiful and functional window treatments define the large master bedroom. Note the luxurious carpet. 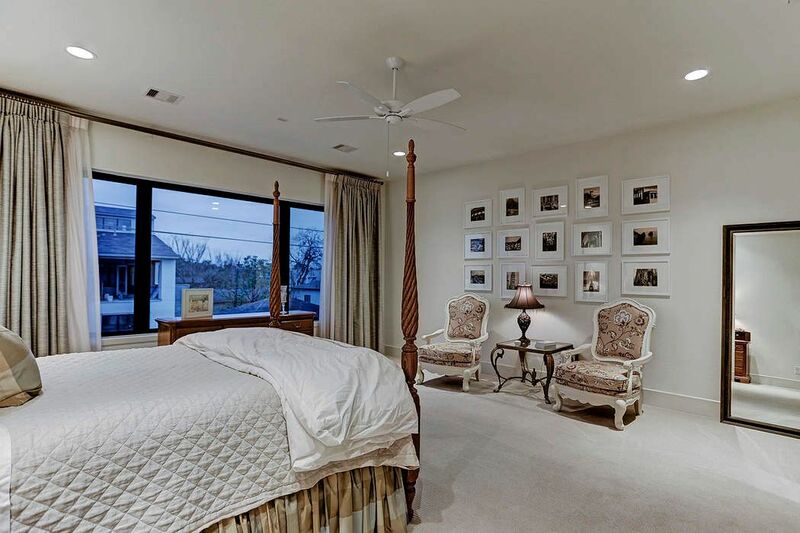 This view of the master bedroom gives you a feel for how large it is. 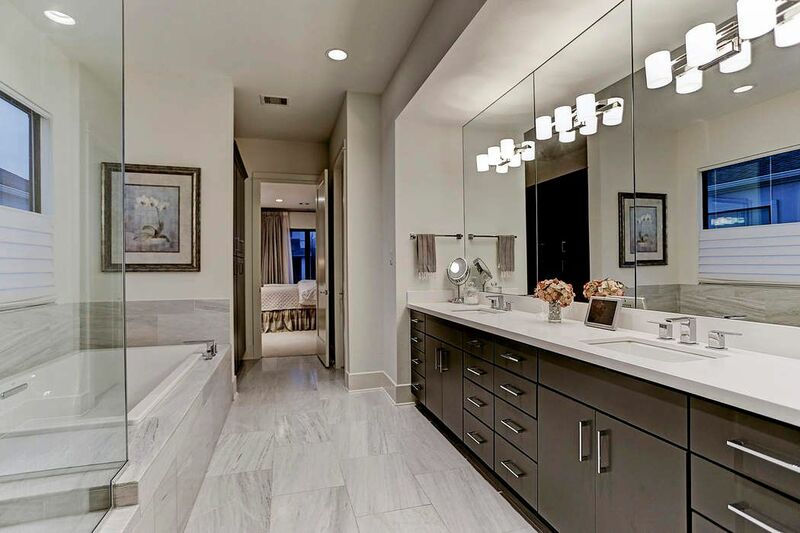 Clean lines and sophisticated materials define the master bath. Dual vanities, excellent lighting, an oversized soaking tub and huge shower with seamless glass come together to create a serene surrounding. It doesn't get much better than this as far as closets go! Built-in drawers and shelves coupled with plenty of hanging space make this a great space! Even room for an bench! Located on the third floor at the back of the house, this generously proportioned secondary room has a trayed ceiling and ensuite bathroom. The ensuite bath is both sleek and clean-lined. 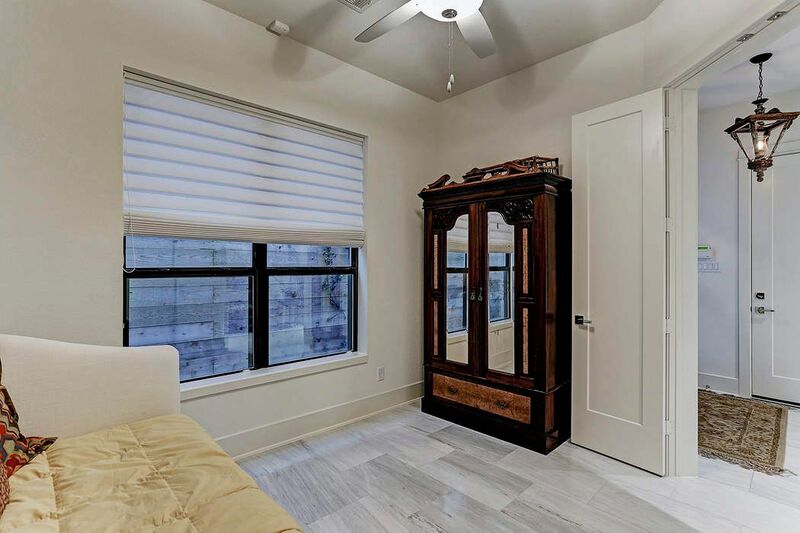 There is a tub/shower behind the curtain. 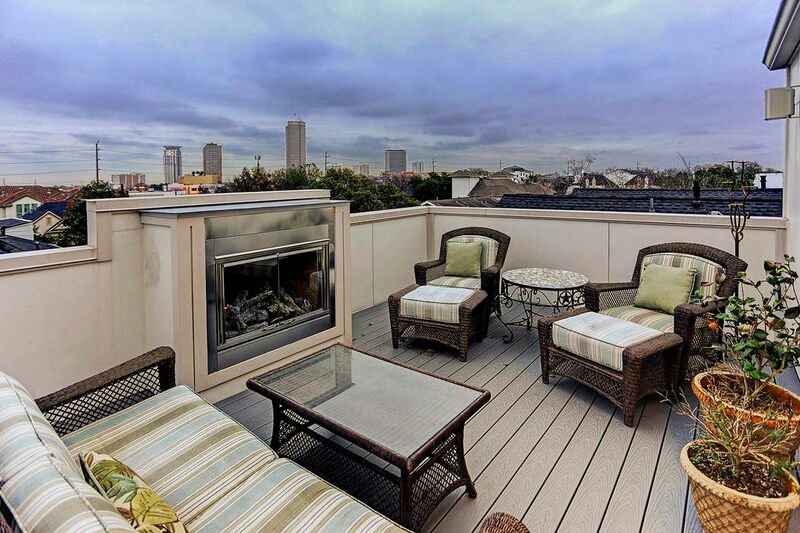 Dramatic views of downtown can be seen from the roof-top terrace. 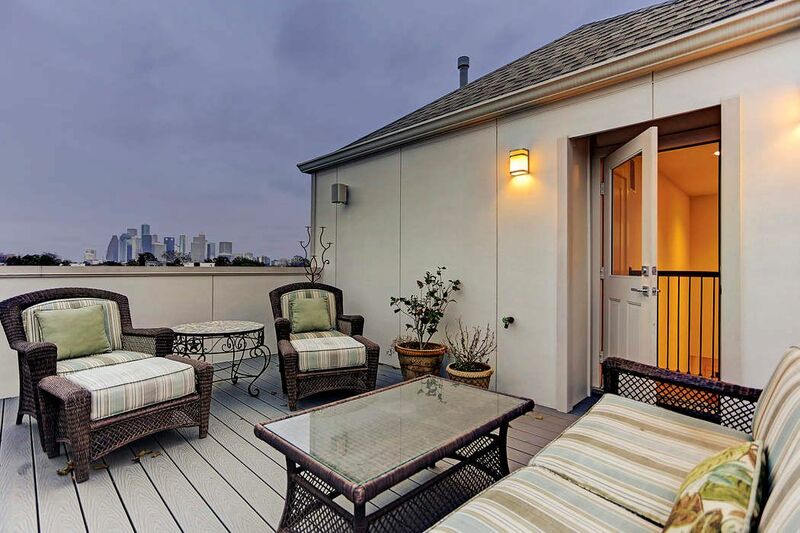 There's plenty of space on this terrace for watching fireworks on the 4th or New Year's Eve. If it's chilly, just flip on the gas fireplace! The flooring of the terrace is composite, designed to withstand sun and rain! The covered patio and backyard are accessed through the ground floor flex room. 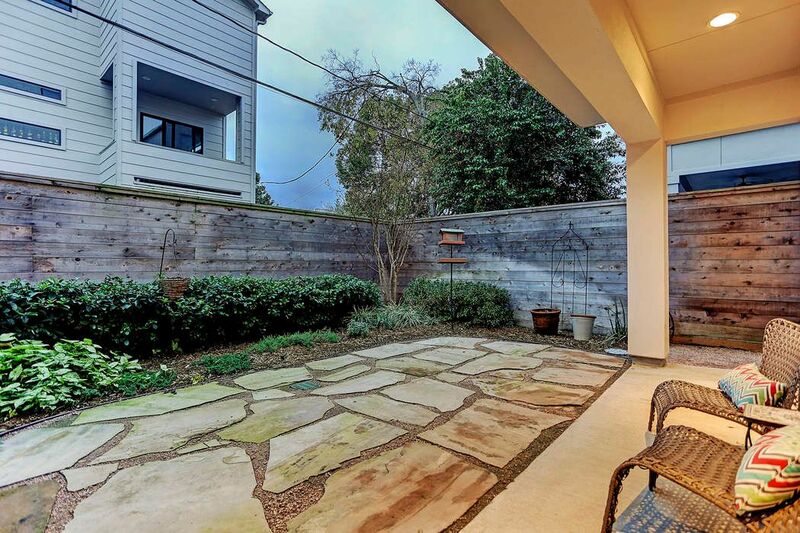 The unusually large backyard features sandstone pavers and can also be accessed from the front of the home. 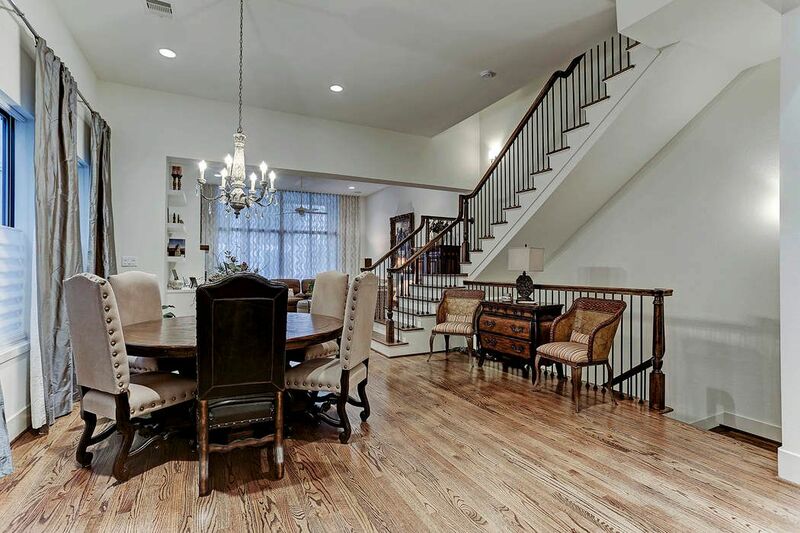 $899,000 3 Bedrooms3 Full / 1 Partial Baths3,584 sq. ft. 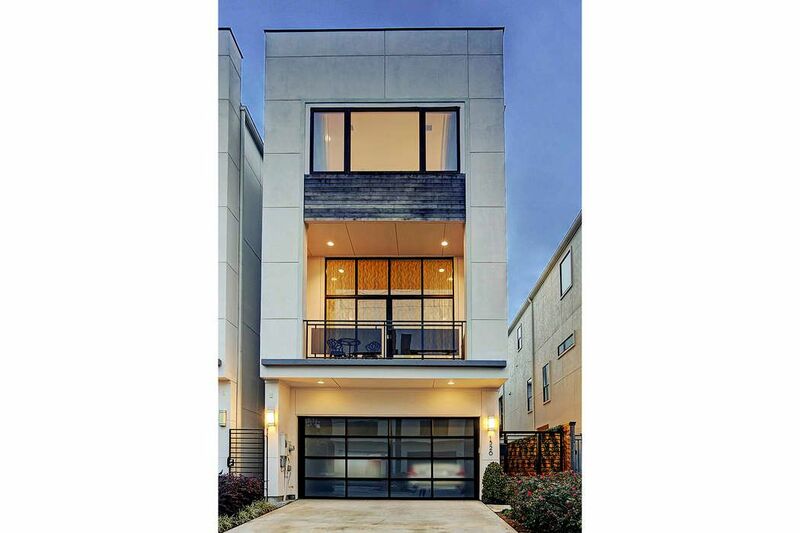 This stunning soft contemporary Montrose home, built by Charles Martin, features the classic details and solid construction he is known for coupled with numerous upgrades. 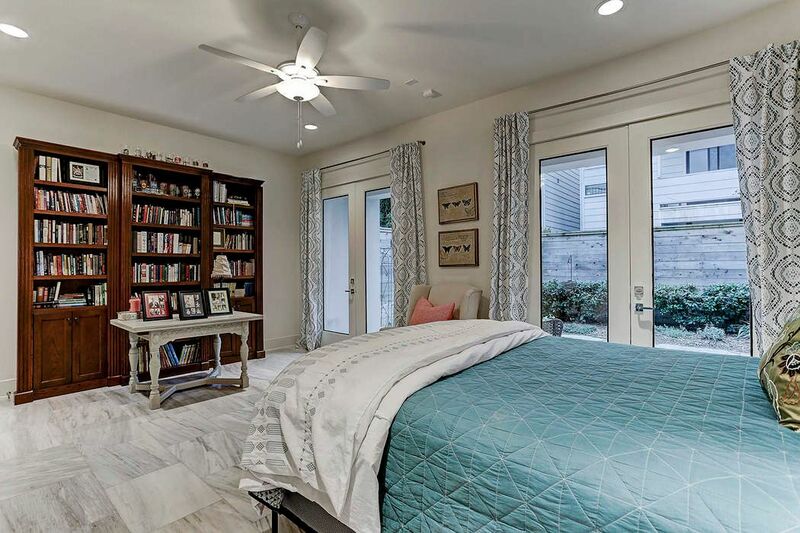 Spacious rooms, gorgeous high-end finishes, light and bright with walls of windows and cozy spaces such as a study and family room tucked behind the kitchen. 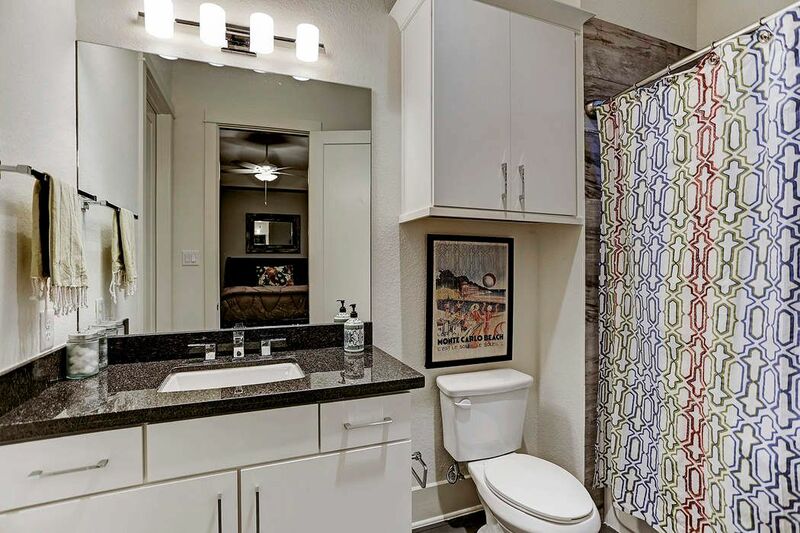 High-end stainless appliances, multiple energy-saving features, lovely backyard and rooftop terrace with fireplace. This home has been lightly lived in and is priced to sell. 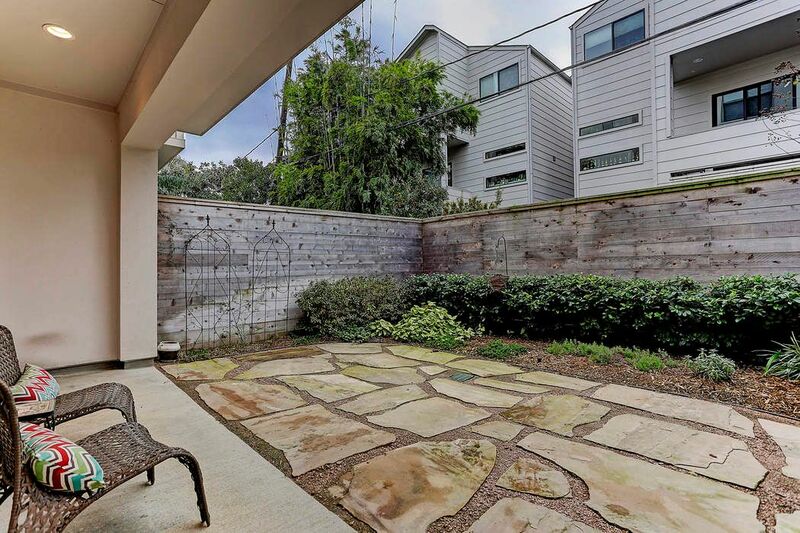 Located near popular restaurants, shopping and Buffalo Bayou Park with easy access to the Medical Center and Downtown.